A large production well with high manganese and iron concentrations was analyzed under dynamic (pumping) conditions. 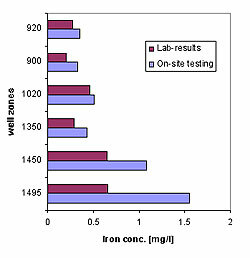 After a spinner analysis, water samples were taken from different depths and immediately tested for iron and manganese. Split samples were also collected and send to a laboratory. The iron concentration varied significantly throughout the day. The concentration decreases from a high at 9:30 AM of 0.88 mg/l to a low at 3:30 PM of 0.46 mg/l; a decrease of almost 50%. 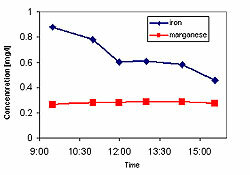 However, around 12 PM more stable iron concentration were observed (see chart below). Manganese concentrations were very stable all day. 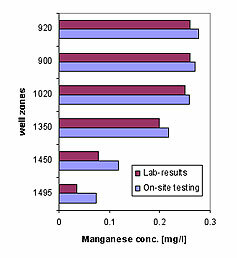 By testing for iron and manganese immediately at the site, information was gained, which showed that the well was not stable concerning iron concentrations. This is most likely caused by the short period of pumping. The depth specific sampling was delayed by a few hours until more stable iron concentrations were observed after 12 PM, because the quality of the mass balance analysis relies heavily on stable concentrations for the parameters tested. Therefore, knowledge about the unstable and decreasing iron concentrations improved the quality of the mass balance analysis significantly. The observed concentrations from the on-site testing were generally higher than the laboratory results. One explanation for the difference is that iron precipitation might have formed during the time delay from sampling to testing in the laboratory, which was more than 30 days. The tendency to form solid iron hydroxides is strongest in the samples with high dissolved iron concentrations. In fact the largest differences between on site and laboratory results are observed in the samples from the deepest formation, which both contained the highest iron concentrations. The was little difference between the on-site and laboratory data. The largest difference was observed in the two samples from 1450 ft and 1495 ft, which had the highest iron concentrations. In these two samples it is likely that manganese co-precipitated with the iron hydroxide precipitation.